The invention relates to preparation of poorly water-soluble effect substances, and especially relates to the use of amphiphilic self-assembling proteins for formulating poorly water-soluble effect substances. The invention also relates to a method of producing effect substance formulations, wherein (i) the poorly water-soluble effect substance is mixed together with the amphiphilic self-assembling protein in a common disperse phase and (ii) then a phase separation into a phase rich in protein and effect substance, and a phase low in protein and effect substance, is carried out. The present invention also relates to cosmetic formulations, pharmaceutical formulations and agrochemical formulations, comprising a poorly water-soluble effect substance formulated by at least one amphiphilic self-assembling protein. 本申请是申请日为2007年1月19日的、发明名称为"两性自组装蛋白质在配制低水溶性的有效物质中的用途"的中国专利申请200780003088. 0(PCT/EP2007/050541)的分案申请。 Chinese Patent  This application is entitled "self-assembled amphiphilic protein use in formulating low soluble active substance" January 19, 2007 filing date of application 200780003088. 0 (PCT / EP2007 / 050541 ) of the divisional application. 本发明涉及两性自组装蛋白质在配制低水溶性的有效物质中的用途。  The present invention relates to self-assembling amphiphilic protein use in formulating low soluble active substance in. DE 10059213A1描述了通过在含蛋白质的保护胶体中分散活性物质、絮凝以及分离覆盖保护胶体的活性物质并转变成干粉来生产水不溶的或低水溶性的活性物质的固体制剂的方法。  DE 10059213A1 describes a process for the solid preparation is dispersed in a protein-containing protective colloids active substance, flocculation and separation of the active material covering the protective colloid and converted into powder to produce a water-insoluble or water-low soluble active substance. 将酪蛋白和牛胶原蛋白、猪胶原蛋白以及鱼胶原蛋白作为优选的保护胶体。 Casein and bovine collagen, porcine collagen and fish collagen as a preferred protective colloid. DE 102004057587A1描述低水溶性活性物质和来自单细胞生物的蛋白质材料的混合物的水性分散液及从其中制成的干粉。  DE 102004057587A1 described aqueous dispersion of the powder mixture and wherein the water-soluble active substance is made low and proteinaceous material derived from a single cell organism. 到目前为止，配制水不溶的或低水溶性的活性物质和有效物质的方法无法满足对活性物质，特别是配制用于化妆品和制药的活性物质的所有要求，如热稳定性、氧化稳定性和耐光性、机械稳定性与毒性的可接受性。  So far, the preparation of water-insoluble or low water soluble active substances the active substance and the method can not meet the active substance, in particular for cosmetic and pharmaceutical formulations of the active substance all the requirements, such as thermal stability, oxidation stability and light resistance, mechanical stability and acceptability toxicity. 因此，本发明旨在提供允许配制低水溶性活性物质的方法，而且比现有技术提供的已知方法能更好地满足上述标准。  Accordingly, the present invention is to provide a method allowing the preparation of low water-soluble active material, and a known method provides better than the prior art meet the above criteria. 在第一个实施方案中，本发明涉及两性自组装蛋白质在配制低水溶性有效物质中的用途。  In a first embodiment, the present invention relates to a self-assembling protein amphoteric use in formulating low soluble active substance. 两亲性自组装蛋白质适于作为低水溶性的疏水性活性物质的配制佐剂。 Self-assembled amphiphilic protein suitable as a low water solubility of hydrophobic active substance formulation adjuvants. 由于其两亲性的分子特征，这些蛋白质在水溶液中能稳定疏水性活性物质。 Because of its two characteristics of the parent molecule of these proteins in aqueous solution is stable hydrophobic active. 这些蛋白质的自组装特征使其呈现更高的分子量结构，并因此持久地包裹疏水性活性物质。 Self-assembling characteristics of these proteins presents a higher molecular weight structures, and thus permanently hydrophobic active package. Qi)然后相分离成富含蛋白质和有效物质的相，以及缺乏蛋白质和有效物质的相。  Qi) is then separated into a phase rich in protein and active substance phase, and the lack of protein and active substance phase. 随后可将富含蛋白质和有效物质的相硬化并作为机械稳定的含有效物质的蛋白质微粒分离，如果合适，进行干燥。  rich phase may then be cured and proteins as active substances and mechanically stable protein microparticles containing the active substances separated, if appropriate, dried. 两亲性自组装蛋白质由氨基酸特别是20种天然形成的氨基酸构成的多肽组成。  The amphiphilic polypeptide comprising amino acids from the protein assembly is formed from the 20 naturally occurring amino acids composition in particular. 氨基酸也可被修饰，如乙酰基化、糖基化、法尼基化。 It may also be amino acid modifications, such as acetylation, glycosylation, farnesylation. 适用于配制低水溶性有效物质的两亲性自组装蛋白质是那些可形成蛋白质微粒的蛋白质。  The amphiphilic suitable for formulating low soluble active substance is the self-assembly of proteins may be those proteins form a protein microparticles. 蛋白质微粒具有球形构造，平均粒子直径从0. 1至100 μπι特别是从0.5至20 μ m，优选从1至5 μ m并且特别优选从2至4 μ m。 Protein microparticles having a spherical configuration, of 0. The average particle diameter of from to 100 μπι. 1 in particular from 0.5 to 20 μ m, preferably from 1 to 5 μ m and particularly preferably of from 2 to 4 μ m.
 蛋白质溶于第一溶剂。  The protein is dissolved in a first solvent. 可用于此处的溶剂，例如盐水溶液。 The solvent can be used herein, such as a salt solution. 具体而言，浓度高于2M，特别是高于4M，而且特别优选高于5M的高浓度盐溶液是合适的，其离子比钠离子和氯离子具有更显著的离液序列高的特征。 Specifically, the concentration is higher than 2M, in particular above 4M, high concentration solution of salt and particularly preferably above 5M is suitable, with a more pronounced ionic chaotropic features than are sodium and chloride ions. 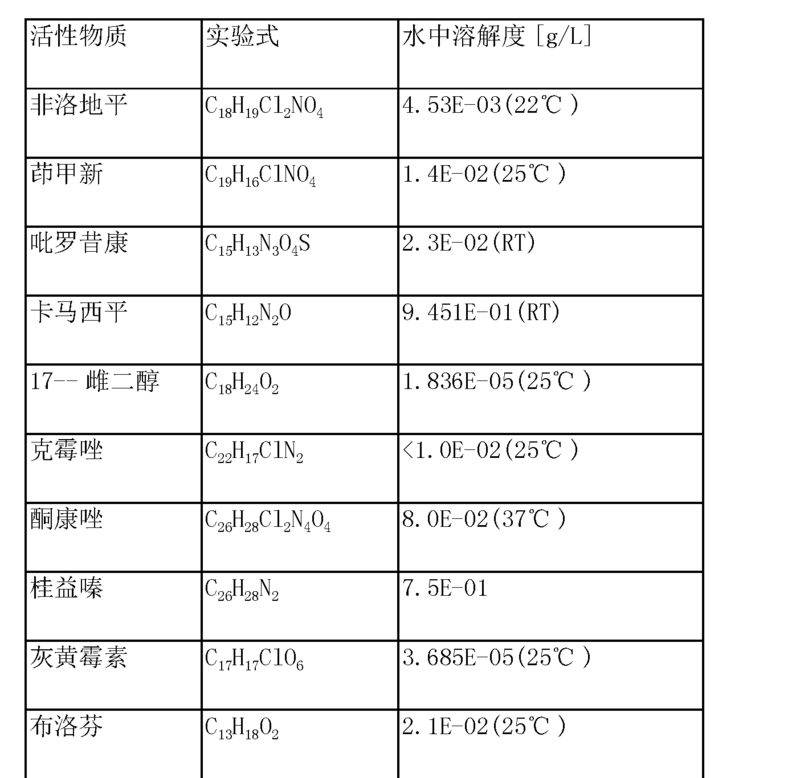 这种盐溶液的实例是6M的硫氰酸胍或9M的溴化锂。 Examples of such a salt solution of 6M guanidinium thiocyanate or of 9M LiBr. 此外，有机溶剂也可用于溶解蛋白质。 In addition, organic solvents may be used to dissolve the proteins. 具体而言，氟化醇、环烃类或有机酸是合适的。 More specifically, fluorinated alcohols, cyclic hydrocarbons or organic acids are suitable. 其实例是六氟异丙醇、环己烷和蚁酸。 Examples thereof are hexafluoroisopropanol, cyclohexane, and formic acid. 蛋白质微粒的制备可在上述溶剂中进行。 Preparation of protein microparticles may be carried out in the solvent. 或者，该溶剂也可由另外的溶剂代替，例如，经过透析或稀释的低浓度盐溶液（c〈0.5M)。 Alternatively, the solvent may also be replaced by another solvent, e.g., low concentrations of salt through dialysis or dilution of the solution (c <0.5M). 溶解的蛋白质终浓度应在0. 1至l〇〇mg/ml。 Dissolved in the final protein concentration should be 0.1 to l〇〇mg / ml. 该方法进行的温度通常是0-80°C，优选5 - 50°C并且特别优选10-40。 The temperature of the method is generally 0-80 ° C, preferably 5 - 50 ° C and particularly preferably 10-40. 。 . 。 . 当使用水溶液时，这些也可与缓冲液混合，优选pH范围为4-10,特别优选5-9,尤其特别优选6-8. 5。  When using an aqueous solution, which may be mixed with a buffer, preferably a pH range of 4-10, particularly preferably 5-9, particularly preferably 6-8. 5. 通过加入添加剂来诱导相分离。  The phase separation is induced by adding an additive. 此处在溶剂和添加剂的混合物中形成乳化的富含蛋白质相。 Here rich in protein form an emulsified mixture of solvent and additives in the phase. 由于表面效应，乳化的富含蛋白质的液滴呈现圆形。 Because of surface effects, emulsified droplets of protein-rich presentation round. 通过溶剂、添加剂和蛋白质浓度的选择，调节蛋白质微粒的平均直径在〇. I ym与100 μLΉ之间。 By selecting a solvent, and protein concentration of the additive, adjusting the average particle diameter of the protein in the square. I ym between 100 μLΉ. 可用的添加剂是一方面易与第一溶剂混合，并且另一方面能诱导富含蛋白质相形成的所有物质。  In one aspect of available additive is miscible with the first solvent, on the other hand all substances capable of inducing protein rich phase formation. 如果微粒形成在有机溶剂中进行，用于该用途的适宜有机物质应该比溶剂的极性低，例如甲苯。 If the particles are formed in an organic solvent, suitably an organic substance for this purpose should be lower than a polar solvent, such as toluene. 在水溶液中，其离子比钠离子和氯离子具有更显著的离液序列高特征的盐（如硫酸铵、磷酸钾）可用作添加剂。 Salts (such as ammonium sulfate, potassium phosphate) in an aqueous solution, which has a more pronounced high ionic chaotropic wherein the ratio of sodium ions and chloride ions as additives. 基于蛋白质溶液，取决于添加剂的性质，添加剂的最终浓度应在以重量计1 %与50%之间。 Based on protein solution, depending on the nature of the additive, between the final concentration of the additive should be 1% by weight and 50%. 富含蛋白质的液滴通过硬化固定，其圆形状保留。  The protein-rich droplets fixing by hardening, retains its circular shape. 这里，固定是基于强的分子间相互作用的发展。 Here, fixation is based on the development of strong intermolecular interactions. 相互作用的类型可以是非共价的，如由于分子间β-折叠叶状晶体的形成， 或共价的，如由于化学交联。 Type of interaction may be non-covalent, such as due to formation of the folded leaflets β- intermolecular crystal, or covalent, such as due to chemical crosslinking. 硬化可以作为由于添加剂和/或由于添加另外合适物质的结果而发生。 Since hardening additives and / or addition results occur due to added substances may be used as appropriate. 硬化发生温度在0 °C与80 °C之间，优选在5 °C与60 °C之间。 Hardening occurs at a temperature between 0 ° C and 80 ° C, preferably between 5 ° C and 60 ° C.
 另外的物质可以是化学交联剂。  Further materials may be a chemical crosslinking agent. 此处化学交联剂应理解为由至少两种化学反应基团通过连接键结合而成的分子。 Here chemical crosslinker molecule to be understood as at least two chemical reactive groups bonded through a linkage. 其实例是巯基反应基团（如顺丁烯二酰亚胺、吡啶二硫化物、α-卤代乙酰类、乙烯基砜、硫酸烷基砜（sulfatoakyl sulfones)(优选硫酸乙基砜）、 胺反应基团（如琥珀酰亚胺酯、碳化二亚胺、羟甲基膦、酰亚胺酯、PFP酯、乙醛、异硫氰酸酯等）、羧基反应基团（如胺等）、羟基反应基团（如异氰酸盐酯等）、非选择性基团（如芳基叠氮化物等）和光可活化基团（如全氟苯基叠氮化物等）。这些反应基团与存在于蛋白质中的胺、硫醇、羧基或羟基基团可形成共价键。 Examples thereof are sulfhydryl reactive group (e.g., maleimide, pyridine disulfide, haloacetyl alpha], vinyl sulfone, alkyl sulfate, sulfone (sulfatoakyl sulfones) (preferably sulfuric acid ethyl sulfone), amine reactive group (e.g., succinimidyl ester, carbodiimide, hydroxymethyl phosphine, imide ester, the PFP ester, acetaldehyde, iso-thiocyanate esters), reaction of carboxyl group (e.g., amine), hydroxyl reactive groups (e.g., isocyanate ester, etc. 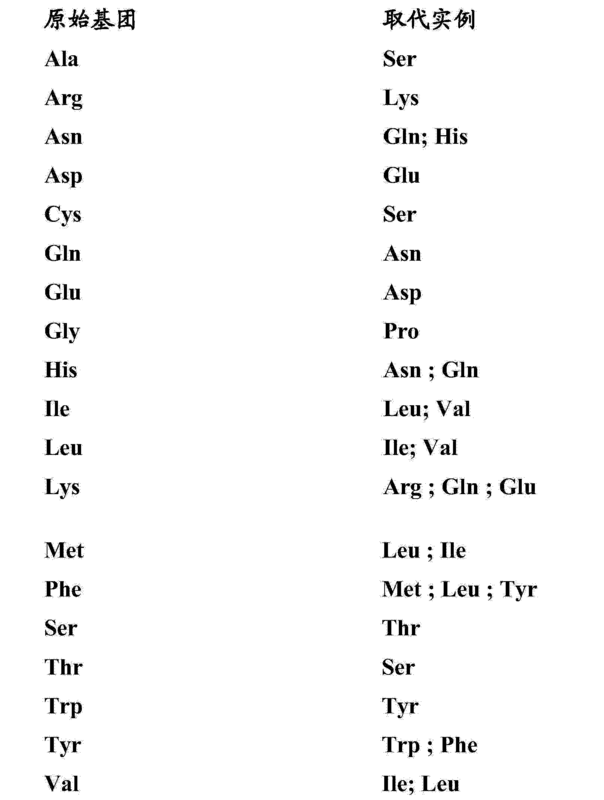 ), non-selective group (e.g., aryl azide, etc.) and a photoactivatable group (e.g. perfluorophenyl azide, etc.). these reactive groups and proteins present in the amine, thiol, carboxyl or hydroxyl group can form a covalent bond. 稳定化的微粒用另外适当的溶剂冲洗，如水，然后通过本领域技术人员公认的方法进行干燥，如冻干法、接触干燥或喷雾干燥。  The stabilized microparticle rinsing with additional appropriate solvent, such as water, and then dried, eg by lyophilization skilled in the art recognized methods, contact drying or spray drying. 使用扫描电子显微镜检查微粒形成与否。 Microparticles using scanning electron microscopy are formed or not. 适宜生产蛋白质微粒的是在水溶液中主要以固有无折叠形式存在的蛋白质。  Suitable protein microparticles are produced mainly in the form of inherent unfolded protein in an aqueous solution. 这种状态可以通过计算实现，例如，依据形成IUpred项目基础的运算法则（http:// iupred. enzim. hu/index, html ；The Pairwise Energy Content Estimated from Amino Acid Composition Discriminates between Folded and Intrinsically Unstructured Proteins ；Zsuzsanna Dosztdinyi、Veronika Csizm0k、Peter Tompa 和Istvan Simon ； J. Mol. Biol. (2005)347, 827-839)。 This state can be achieved by calculating, for example, is formed based on the basis of algorithms IUpred project (http: // iupred enzim hu / index, html; The Pairwise Energy Content Estimated from Amino Acid Composition Discriminates between Folded and Intrinsically Unstructured Proteins;.. Zsuzsanna Dosztdinyi, Veronika Csizm0k, Peter Tompa and Istvan Simon;. 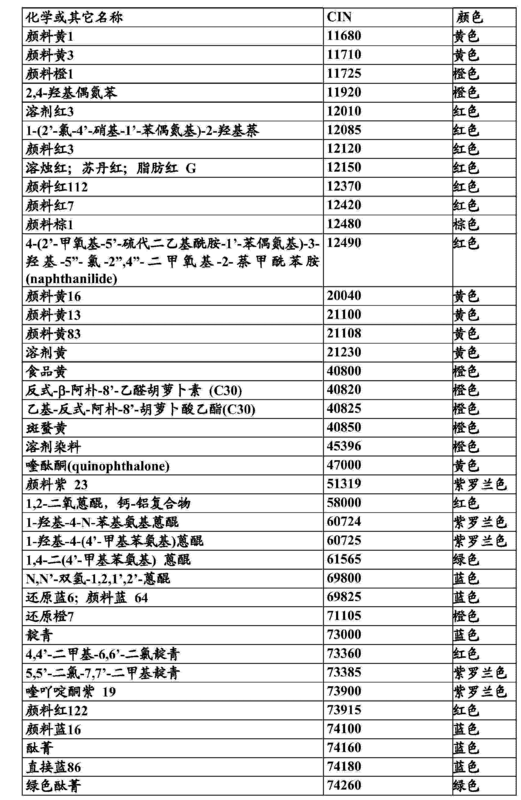 J. Mol Biol (2005) 347, 827-839).. 当对于超过50%的氨基酸残基依照该运算法则计算出值>0.5时，可以认定为主要以固有无折叠状态存在（预测类型：长无序性）。 When more than 50% for the amino acid residues in accordance with the calculated value of the algorithm> 0.5, can be identified as primarily (prediction type: Long disorder) to the intrinsic non-folded state. 用于配制低水溶性有效物质的特别合适的蛋白质是能够从蜘蛛中以其原有形式被分离的蛛丝蛋白。 Particularly suitable protein  used in formulating low soluble active substance in its original form is capable of being isolated from spider silk proteins. 特别合适的蛋白质是能从蜘蛛的"主壶腹"腺分离的丝蛋白。 Particularly suitable are proteins from the spider "major ampullate" isolated gland silk protein. 用于配制低水溶性有效物质的同样合适的蛋白质是从天然丝蛋白衍生的并且在原核或真核表达系统中使用基因工程方法异源产生的天然或合成蛋白质。 Also suitable protein  used in formulating low soluble active substance is derived from a natural silk proteins and natural or synthetic proteins using genetic engineering methods in a prokaryotic or eukaryotic expression system of heterologous generated. 原核表达生物的非限定性实例是大肠杆菌（Escherichia coli)、枯草芽孢杆菌（Bacillus subtilis)、巨大芽抱杆菌（Bacillus megaterium)、谷氨酸棒状杆菌（Corynebacterium glutamicum)等。 Non-limiting examples of prokaryotic expression organism is Escherichia coli (Escherichia coli), Bacillus subtilis (Bacillus subtilis), Bacillus great spores (Bacillus megaterium), Corynebacterium glutamicum (Corynebacterium glutamicum) and the like. 真核表达生物的非限定性实例是酵母，如酿酒酵母（Saccharomyces cerevisiae)、毕赤酵母（Pichia pastoris)等，丝状真菌，如黑曲霉（Aspergillus niger)、米曲霉（Aspergillus oryzae)、构巢曲霉（Aspergillus nidulans)、里氏木霉（Trichoderma reesei)、顶头抱产黄青霉（Acremonium chrysogenum)等，哺乳动物细胞，如HeLa细胞、COS细胞、CHO细胞等， 昆虫细胞，如Sf9细胞、MEL细胞等。 Non-limiting examples of eukaryotic organisms is a yeast, such as yeast (Saccharomyces cerevisiae), Pichia pastoris (Pichia pastoris), etc., filamentous fungi, such as Aspergillus niger (Aspergillus niger), Aspergillus (Aspergillus oryzae), nidulans Aspergillus (Aspergillus nidulans), Trichoderma reesei (Trichoderma reesei), hold the plug P. chrysogenum (Acremonium chrysogenum) and the like, mammalian cells such as HeLa cells, COS cells, CHO cells, insect cells, such as Sf9 cells, MEL cells. 用于配制低水溶性有效物质的合成的丝蛋白中，优选基于天然蛛丝蛋白的重复单位的合成蛛丝蛋白。 Synthetic silk proteins  used in formulating low soluble active substance, synthetic spider silk protein is preferably repeating units based on natural spider silk protein. 除合成的重复蛛丝蛋白序列外，这些可另外包括一个或多个天然非重复蛛丝蛋白序列。 In addition to the repeat sequence of the synthetic spider silk protein, which may additionally comprise one or more natural non-repetitive spider silk protein sequences. 在合成蛛丝蛋白中，所谓的C16蛋白质是参考（Huemmerich等人Biochemist ry，43(42) :13604-13612(2004))而提及。  In the synthetic spider silk protein, called the reference protein is a C16 (Huemmerich et al Biochemist ry, 43 (42): 13604-13612 (2004)) are mentioned. 该蛋白质具有如SEQ ID NO: 1所示的多肽序列。 As the protein having SEQ ID NO: 1 in the polypeptide sequence shown in FIG. 除在SEQ ID NO: 1所示的多肽序列外，也优选该序列的特定的功能当量物、功能衍生物及盐。 In addition to SEQ ID NO: functional equivalents thereof specific polypeptide sequence shown in the outer, also preferably of the sequence, functional derivatives and salts thereof. 依据本发明，"功能当量物"也可以特别理解为突变体，其在上述氨基酸序列中至少有一个序列位点上的氨基酸与明确提到的氨基酸不同，但却具有包装低水溶性有效物质有义突变体。  According to the present invention, "functional equivalent thereof" may be understood to mean in particular mutants, having at least one amino acid sequence position to an amino acid different from the explicitly mentioned in the above amino acid sequence, but having a low water-soluble packaging effective material sense mutants. "功能当量物"因此包括由一个或多个氨基酸添加、取代、缺失和/或颠倒可获得的突变体，所述改变可发生在任何序列位点，假如它们形成带有依据本发明的特性谱的突变体。  "functional equivalent thereof" thus includes adding one or more amino acid substitutions, deletions and / or reverse mutants obtained, the change can occur in any sequence position, provided they are formed according to the present invention with spectral characteristics of mutants. 功能等价也特别存在于当突变体和未改变的多肽之间反应模式是定性相符时。 Functional equivalents also exists in particular when the reaction between the mutant and mode polypeptide is unchanged in qualitative agreement. 从上述意义上，"功能当量物"也是所述多肽的"前体"并且也是多肽的"功能衍生物"和"盐"。  From the above sense, "functional equivalent thereof" is a polypeptide "precursor" and polypeptide are "functional derivatives" and "salt." 此处，"前体"是具有或不具有期望的生物活性的多肽的天然或合成前体。 Natural or synthetic polypeptide biological activity  Here, the "precursor" with or without the desired precursor. 依据本发明，"盐"应理解为指羧基基团的盐和根据本发明的蛋白质分子氨基的酸加成盐。  According to the present invention, "salt" is understood to mean a salt of a carboxyl group and an amino acid addition salts according to the protein molecules of the invention. 可以本身已知的方式制备羧基基团的盐，包括无机盐，如钠、钙、铵、铁和锌盐，以及含有有机碱基的盐，如胺，如三乙醇胺、精氨酸、赖氨酸、哌啶等。 May be prepared in a manner known per se, salts of carboxyl groups include inorganic salts such as sodium, calcium, ammonium, iron and zinc, and salts with organic bases such as amines, such as triethanolamine, arginine, lysine acid, piperidine and the like. 本发明同样提供酸加成盐， 如含有无机酸如盐酸或硫酸的盐，以及含有有机酸如乙酸和草酸的盐。 The present invention also provides acid addition salts, such as those containing inorganic acids such as hydrochloric acid or sulfuric acid, and organic acids such as acetic acid and oxalic acid salts containing. 借助已知技术在功能性氨基酸侧基或在其N或C末端同样也可制备依据本发明的多肽的"功能衍生物"。  In the known art by means of functional amino acid side groups or the same "functional derivative" polypeptide according to the present invention may also be prepared at its N-or C-terminus. 该类型的衍生物包括，例如通过与氨、或与伯胺或仲胺反应获得的羧酸基团的脂肪酸酯、羧酸基团的酰胺，与酰基反应制备的游离氨基的N-酰基衍生物，或与酰基反应制备的游离羟基的〇-酰基衍生物。 Derivatives of this type include, for example, by a fatty acid ester of carboxylic acid groups with ammonia or a primary amine, or secondary amine obtained, carboxylic acid amide groups, prepared by reacting the free amino group with an acyl group derived N- was 〇- acyl derivatives or free hydroxy groups with acyl prepared reaction. 在下文中，术语低水溶性有效物质、疏水性有效物质、疏水性活性物质以及效应分子可同义的使用。  In the following, the term low water soluble active substance, a hydrophobic active substance, and a hydrophobic active effector molecule may be used synonymously. 在下文中，术语低水溶性有效物质用来指20°C时水中溶解度以重量计小于5%，优选以重量计小于1%，特别优选以重量计小于0.5%，极其优选以重量计小于0. 1 %的那些化合物。 Hereinafter, the term low water soluble active substance used to refer to 20 ° C solubility in water of less than 5% by weight, preferably less than 1% by weight, particularly preferably less than 0.5% by weight, most preferably less than 0 wt. 1% of those compounds. 另外优选的效应分子是脂肪酸，特别是具有烷基支链的饱和脂肪酸，特别是优选支链花生酸，如18-甲基花生酸。  Further preferred effector molecules are fatty acids, particularly saturated fatty acid having a branched alkyl group, particularly preferably a branched arachidic acid, arachidic acid such as 18-methyl. 另外优选的效应分子是类胡萝卜素。  Further preferred effector molecule is a carotenoid. 依据本发明，类胡萝卜素应理解为指下列化合物及其酯化的或糖基化的衍生物：β -胡萝卜素、番茄红素、叶黄素、虾红素、玉米黄质、 隐黄质、茜草黄质、斑蝥黄、胭脂树橙、β -阿朴-4-胡萝卜素醛、β -阿朴-8-胡萝卜素醛、 β -阿朴-8-胡萝卜酸乙酯、链孢红素、海胆酮、金盏花红素、紫黄质、圆酵母素、圆酵母红素，单独地或作为混合物。 According to the present invention, the carotenoid is understood to mean the following compounds and esterified or glycosylated derivatives: β - carotene, lycopene, lutein, astaxanthin, zeaxanthin, cryptoxanthin , madder zeaxanthin, canthaxanthin, bixin, β - -4- apo-carotenal, β - -8- apo-carotenal, β - apo -8- ethyl carrots, red pigment Alternaria , echinenone, adonirubin, violaxanthin, round yeast, torula yeast red pigment, alone or as a mixture. 优选使用的类胡萝卜素是β-胡萝卜素、番茄红素、叶黄素、虾红素、玉米黄质、茜草黄质和斑蝥黄。 Carotenoids preferably used are β- carotene, lycopene, lutein, astaxanthin, zeaxanthin, cryptoxanthin and madder canthaxanthin. 另外优选的效应分子是维生素，特别是类维生素A及其酯。  Further preferred effector molecules are vitamins, especially vitamin A and its esters class. 本发明的内容中，类维生素A指维生素A醇（视黄醇）及其衍生物，例如维生素A 醛（视黄醛）、维生素A酸（视黄酸）和维生素A酯（如视黄醇乙酸酯、视黄醇丙酸酯和棕榈酸视黄酯）。  The present invention refers to the class of vitamin A vitamin A alcohol (retinol) and its derivatives, such as vitamin A aldehyde (retinal), Vitamin A acid (retinoic acid) and Vitamin A esters (e.g. retinyl acetate, retinyl propionate and retinyl palmitate). 此处术语视黄酸包括所有反式视黄酸以及13-顺式视黄酸。 The term retinoic acid includes all-trans retinoic acid and 13-cis-retinoic acid. 术语视黄醇和视黄醛优选包括所有反式化合物。 The term & retinol and retinal preferably comprising all-trans compound. 依据本发明用于制剂的优选类维生素A是所有反式视黄醇，下面称作视黄醇。 A preferred formulation for retinoids in accordance with the present invention is all-trans retinol, retinol referred to below. 另外优选的效应分子是来自A、C、E和F族的维生素、维他命原以及维生素前体，尤其是3, 4-脱氢视黄醇、β -胡萝卜素（维生素A的维他命原）、抗坏血酸的棕榈酸酯、生育酚，特别是α-生育酚及其酯，如乙酸酯、烟酸酯、磷酸盐和琥珀酸盐，以及维生素F，其中已知的必需脂肪酸，尤其是亚油酸、亚麻酸和花生四烯酸。  Further preferred effector molecules derived from vitamin A, C, E and F Group, provitamin and vitamin precursors, in particular 3, 4-dehydro retinol, β - carotene (provitamin Vitamin A ), ascorbyl palmitate, tocopherols, in particular α- tocopherol and its esters, such as acetate, nicotinate, phosphate and succinate and vitamin F, where known essential fatty acids, in particular linoleic acid, linolenic acid and arachidonic acid. 另外优选的效应分子是来自维生素E族的亲脂性的、溶于油的抗氧化剂，即生育酚及其衍生物、没食子酸酯、类黄酮和类胡萝卜素，以及丁羟基甲苯/苯甲醚。  Further preferred effector molecule is lipophilic, oil-soluble antioxidant from the vitamin E group, i.e. tocopherol and derivatives, gallic acid esters, flavonoids and carotenoids, and butylhydroxytoluene / benzene ether. 另外优选的效应分子是硫辛酸及其合适的衍生物（盐、酯、糖、核苷酸、核苷、肽和脂质）。  Further preferred effector molecule is lipoic acid and suitable derivatives (salts, esters, sugars, nucleotides, nucleosides, peptides and lipids). 另外优选的效应分子是UV光保护过滤物。  Further preferred effector molecule is a UV light protection filter substance. 这些应理解为指能吸收紫外线并以长波辐射如热的形式再次释放吸收的能量的有机物质。 These should be understood as meaning capable of absorbing ultraviolet rays to long wave radiation and thermal energy released in the form of absorbing organic substances again. 3-苯亚甲基樟脑及其衍生物，如3-(4-甲基苯亚甲基）樟脑；4-氨基苯甲酸衍生物，优选2-乙基己基4_(二甲氨基）苯甲酸酯、2-辛基4_(二甲氨基）苯甲酸酯和戊基4_(二甲氨基）苯甲酸酯；肉桂酸的酯，优选2-乙基己基4-甲氧基肉桂酸辛酯、丙基4-甲氧基肉桂酸辛酯、异戊基4-甲氧基肉桂酸辛酯、异戊基4-甲氧基肉桂酸辛酯、2-乙基己基2-氰基-3-苯基肉桂酸辛酯（奥克立林）；水杨酸的酯，优选2-乙基己基水杨酸酯、4-异丙苯甲基水杨酸醋、三甲基环己基水杨酸醋（homomenthyl salicylate);苯甲酮衍生物，优选2-羟基-4-甲氧基苯甲酮、2-羟基-4-甲氧基-4' -甲基苯甲酮、2, 2' -二羟-4-甲氧基苯甲酮；苯亚甲基丙二酸的醋，优选双-2-乙基己基4-甲氧基苯甲酮；三嗪衍生物，例如， 2, 4, 6-三苯胺基-(对-羰-2' -乙基-1'-己氧基）-1，3, 5-三嗪（三苯胺三嗪）和双辛基氨基三嗪酮（U  3- benzylidene camphor and derivatives thereof, such as 3- (4-methylbenzylidene) camphor; 4-aminobenzoic acid derivatives, preferably 2-ethylhexyl 4 _ (dimethylamino) benzoate, 2-octyl 4_ (dimethylamino) benzoate and pentyl 4_ (dimethylamino) benzoate; esters of cinnamic acid, preferably 2-ethylhexyl 4-methoxycinnamate octyl, propyl octyl 4-methoxycinnamate, isopentyl 4-methoxycinnamate, octyl, isopentyl 4-methoxycinnamate, octyl, 2-ethylhexyl 2-cyano-3- octyl phenyl (octocrylene); ester of salicylic acid, preferably 2-ethylhexyl salicylate, 4-methyl salicylate vinegar cumene, trimethyl cyclohexyl acetic acid (homomenthyl salicylate); benzophenone derivatives, preferably 2-hydroxy-4-methoxybenzophenone, 2-hydroxy-4-methoxy-4 '- methyl benzophenone, 2, 2' - bis hydroxyl-4-methoxy benzophenone; benzylidene malonate vinegar, preferably di-2-ethylhexyl 4-methoxy benzophenone; triazine derivatives, e.g., 2, 4, 6 - triphenylamine - (p - carbonyl - 2 '- ethyl-1'-hexyloxy) -1,3,5-triazine (triazine triphenylamine) and bis-amino-octyl triazone (U vasorb®HEB);丙烷-1，3-二酮，例如，1-(4-叔丁基）-3-(4'-甲氧基苯基）丙烷_1，3-二酮。 vasorb®HEB); 1,3-dione, e.g., 1- (4-tert-butyl) -3- (4'-methoxyphenyl) propane _1,3- dione. 特别优选肉桂酸酯的应用，优选2-乙基己基4-甲氧基肉桂酸辛酯、异戊基4-甲氧基肉桂酸辛酯、2-乙基己基2-氰基-3-苯基肉桂酸辛酯（奥克立林）。  Particularly preferred applications cinnamate, preferably 2-ethylhexyl 4- octyl methoxycinnamate, isopentyl 4-methoxycinnamate, octyl, 2-ethylhexyl 2-cyano-3- octyl phenyl (octocrylene). 此外，优选苯甲酮衍生物的应用，特别是2-羟基-4-甲氧基苯甲酮、2-羟基-4-甲氧基-4'-甲基苯甲酮、2, 2'-二羟-4-甲氧基苯甲酮、以及丙烷-1，3-二酮的应用，如1-(4-叔丁基）-3-(4' -甲氧基苯基）丙烷-1，3-二酮。  Further, the application preferably benzophenone derivatives, in particular 2-hydroxy-4-methoxybenzophenone, 2-hydroxy-4-methoxy-4'-methyl benzophenone, 2, 2'-dihydroxy-4-methoxy benzophenone, 1,3-dione and applications, such as 1- (4-tert-butyl) -3- (4 '- methoxyphenyl) 1,3-dione. 苯甲酰基甲烷的衍生物，例如，1_(4'_叔丁基苯基）-3-(4'_甲氧基苯基）丙烷-1，3-二酮，4-叔丁基-4' -甲氧基联苯甲酰甲烷或1-苯基1-3-(4' -异丙基苯基）丙烷-1，3-二酮；苯甲酮的氨羟基取代衍生物，例如，N，N-二乙基氨羟基苯甲酰一正一苯甲酸己酯。  benzoyl methane derivative, e.g., 1_ (4'_-tert-butylphenyl) -3- (4'_ methoxyphenyl) propane-1,3-dione, 4-tert-butyl -4 '- methoxy dibenzoyl methane or 1-phenyl-1-3- (4' - isopropylphenyl) propane-1,3-dione; hydroxy-substituted benzophenone derivatives of amino , e.g., N, N- diethylamino hydroxybenzoyl hexyl benzoate a n a.
 UV-A和UV-B过滤物当然也可以混合物来使用。  UV-A and UV-B filters may of course also be a mixture. 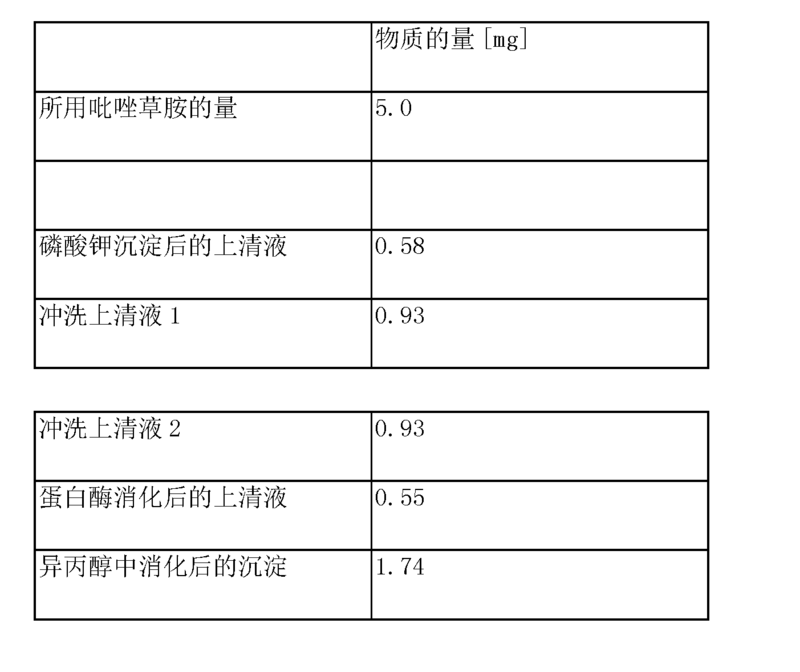 合适的UV过滤物列于下表中。  Suitable UV filters was listed in the following table. 除上述两类初级光保护物质之外，也可能使用抗氧化剂类型的二级光保护制剂， 其干扰UV放射物透入皮肤时触发的光化学反应链。  In addition to the above two types of primary light protection substances, also possible to use two types of antioxidants, light protection agents, UV radiation which interferes with the photochemical reaction chain triggered when the object through the skin. 其典型实例是生育酚（维生素E)和溶于油的抗坏血酸衍生物（维生素C)。 Typical examples of the ascorbic acid derivative is tocopherol (vitamin E), and oil-soluble (vitamin C). 依据本发明，所述化合物的适宜衍生物（盐、酯、糖、核苷酸、核苷、肽和脂质）可用作效应分子。  According to the present invention, suitable derivatives (salts, esters, sugars, nucleotides, nucleosides, peptides and lipids) of the compound may be used as effector molecules. 另外优选的是所谓的过氧化物分解剂，即可分解过氧化物的化合物，特别优选分解脂质过氧化物。  Further preferred are the so called peroxide decomposer, can decompose a peroxide compound, particularly preferably a lipid peroxide decomposition. 这些可理解为包括有机物质，如5-羟基嘧啶衍生物和3-羟基吡啶衍生物以及丙丁酚。 These may be understood to include organic materials, such as 5-hydroxy-3-hydroxypyridine derivatives and pyrimidine derivatives and probucol. 此外，所述过氧化物分解剂优选是描述于专利申请W0/0207698和W0/03059312中的物质，对其内容，此处明确作出参考，优选其中描述的含硼或含氮化合物，其能够将过氧化物或氢过氧化物还原成相应的醇而没有自由基转变产物的形成。  In addition, preferably the peroxide decomposer is described in the patent application W0 / 0207698 and W0 / 03059312 substance, its content, explicit reference is made herein, preferably wherein the boron-containing or nitrogen-containing compounds described, which is capable of reducing the peroxide or hydroperoxide to the corresponding alcohol are formed without a radical change in the product. 空间位阻胺也可用于该用途。 Sterically hindered amines can also be used for this purpose. 另一类是抗刺激剂，其在由UV光损伤的皮肤上具有抗炎症效果。  Another type of anti-irritants which have anti-inflammatory effect on the skin from the damage of UV light. 这些物质是例如没药醇、叶绿醇和植烷三醇。 These materials are, for example, bisabolol, phytol and phytantriol. 另一类低水溶性效应物质是可用于作物保护，如除草剂、杀虫剂和杀真菌剂的活性物质。  Another effect of low soluble substance is used in crop protection, the active substance as herbicides, insecticides and fungicides. 另外适合作为低水溶性有效物质的是用于制药学上用途的活性物质，特别是那些用于口服用途的活性物质。  Further suitable as the low water-soluble active substances are pharmaceutically active substances for the purpose, especially those active substances for oral use. 不论医学指征，依据本发明的方法原则上可用于大量活性物质。 Regardless of medical indications, in principle, the method according to the present invention may be used in a large number of active substances. 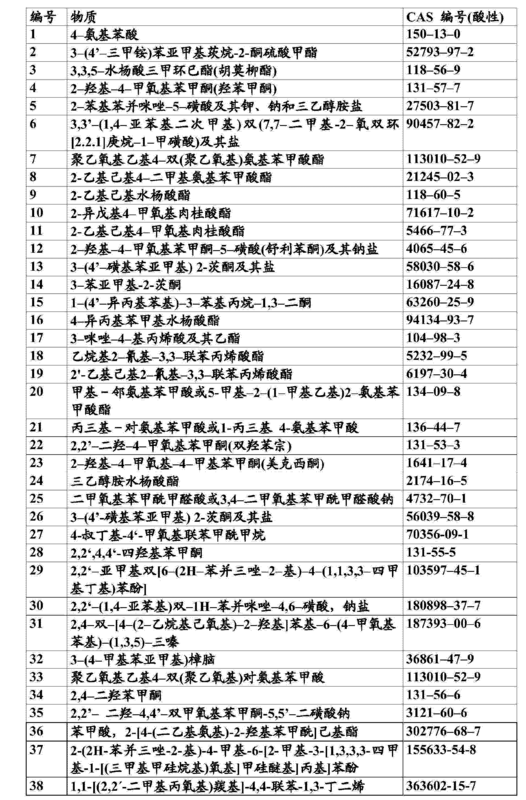 适宜用于药物的低水溶性活性物质的实例列于下表。  Examples of suitable active substances of low water solubility for drugs listed in the table. 低水溶性活性物质的配制可使用两亲性自组装蛋白质以多种方式来制备。  formulating low soluble active substance may be prepared using an amphiphilic self-assembly of proteins in a variety of ways. 可将低水溶性、疏水性的活性物质包装在蛋白质微粒中或以通过蛋白质包被的胶体分散方式来稳定，其可实现于如微粉化样品组（batch)中。 It can be low water solubility, hydrophobic active substance or packaged in a protein microparticles through the protein coating of the colloidal dispersion to a stable manner, which may be implemented in micronized sample set (BATCH) in. 疏水性的活性物质的配制可通过包被在微粒中来进行。 Formulation of hydrophobic active material in the microparticles can be carried out by the packet. 该过程包括两个步骤。 The process comprises two steps. 第一步，将疏水性的活性物质和两亲性自组装蛋白质溶解于共同相中。 The first step, the active substance and hydrophobic self-assembled amphiphilic protein is dissolved in a common phase. 为此，活性物质和蛋白质可由溶剂或溶剂混合物直接溶解。 For this purpose, the active substance and the protein may be dissolved directly in a solvent or solvent mixture. 备选地，可首先将活性物质和蛋白质溶解于不同溶剂中然后将溶液混合起来，因而再次形成共同相。 Alternatively, the active substance may be first dissolved in the protein and various solvents and then the solutions were mixed together, thereby forming a common phase again. 共同相可以是分子性分散相或胶体性分散相。 Common dispersed phase may be a molecular or colloidal dispersion phase. 疏水性活性物质和蛋白质不能溶解于共同溶剂或溶剂混合物中时，在不同溶剂中溶解疏水性活性物质和蛋白质以及后续混合这两种溶液是特别有效的。  hydrophobic active substance and the protein can not be dissolved in a common solvent or solvent mixture, to dissolve the active substance and the hydrophobic proteins and subsequent mixing of the two solutions in various solvents is particularly effective. 这样通过该过程， 将溶解在合适溶剂中的活性物质稀释于活性物质不能溶解的另一种溶剂中，也可制备疏水性活性物质的胶体分散溶液。 Thus by this process, will be dissolved in a suitable solvent, the active substance diluted in another solvent not dissolving the active substance, the active substance is a hydrophobic colloid may also be prepared dispersion solution. 因为蛋白质通常是易溶于水的，优选的是对水溶液以及水和易混合于水的有机溶剂的混合物起作用。  Since proteins are usually soluble in water, preferably a mixture of an aqueous solution, and water is mixed in water and ease an organic solvent acts. 合适的、易混合于水的溶剂的实例是醇，如甲醇、乙醇和异丙醇，氟化醇，如六氟异丙醇和三氟乙醇，烷酮，如丙酮，以及亚砜，例如二甲基亚砜，或甲酰胺，如二甲基甲酰胺，或其它有机溶剂，例如四氢呋喃和氰甲烷或N-甲基-2-吡咯酮。  Suitable, examples of water-miscible solvents are alcohols such as methanol, ethanol and isopropanol, fluorinated alcohols such as trifluoroethanol and hexafluoroisopropanol, alkanone, such as acetone, and sulfoxides, such as dimethyl sulfoxide, or formamide such as dimethylformamide, or other organic solvents, such as tetrahydrofuran and cyanogen methane or N- methyl-2-pyrrolidone. 通常，可能对可溶解蛋白质的溶剂或溶剂混合物起作用。 Typically, it may act on a mixture of solvent or solvent soluble protein. 合适溶剂的实例是氟化醇，例如六氟异丙醇或三氟乙醇，离子流体，如EMM乙酸酯，离液序列高的盐（chaotropic salts)的水溶液，如尿素、盐酸胍和硫氰酸胍，或有机酸，如蚁酸，以及这些溶剂与其它有机溶剂的混合物。 Examples of suitable solvents are fluorinated alcohols such as hexafluoroisopropanol or trifluoroethanol, ionic fluid, such as EMM acetate, an aqueous solution of chaotropic salts (chaotropic salts), such as urea, guanidine hydrochloride and thiocyanate guanidine, or an organic acid such as formic acid, and mixtures of these solvents with other organic solvents. 可与针对蛋白质的溶剂混合的溶剂的实例尤其是醇，如甲醇、乙醇和异丙醇，烷酮，如丙酮，亚砜，如二甲基亚砜， 甲酰胺，如二甲基甲酰胺，卤代烷，如二氯甲烷，以及另外的有机溶剂，如四氢呋喃。 Examples of the solvent may be mixed with a solvent for the protein, especially an alcohol, such as methanol, ethanol and isopropanol, alkanones, such as acetone, sulfoxides such as dimethyl sulfoxide, formamide, such as dimethylformamide, alkyl halides such as dichloromethane, and an additional organic solvent, such as tetrahydrofuran. 在微粒中配制疏水性活性物质的第二步是将相分离成缺乏蛋白质和活性物质的相以及富含蛋白质和活性物质继而硬化的相。  The formulation of hydrophobic active substance in the microparticles is phase separation into a second step the lack of protein and with the active material and the active material rich in protein and then hardening phase. 此处将疏水性活性物质掺入蛋白质的组装形式。 Here the hydrophobic active substance incorporated in assembled form of the protein. 由于相分离过程中的表面效应，优选形成圆形蛋白质结构，即所谓的微粒。 Since the surface effect the phase separation process, preferably a protein form a circular structure, i.e. a so-called microparticles. 相分离是优选通过将离液盐（lyotropic salt)的水溶液加入到蛋白质与疏水性活性物质的混合物中来诱导。  The phase separation is preferably induced by the addition of protein to a hydrophobic active substance from the aqueous salt solution (lyotropic salt) mixture. 合适的离液盐（lyotropic salt)由霍夫迈斯特系列描述。 Suitable chaotropic salts (lyotropic salt) is described by Hofmeister series. 硫酸铵和磷酸钾是特别合适的。 Ammonium sulphate and potassium phosphate are particularly suitable. 这些溶液的加入可由简单混合、逐滴添加或经由透析来进行。 These solutions may be added by simple mixing, or by adding dropwise via dialysis. 疏水性活性物质和蛋白质之间的相互作用主要是基于它们的疏水特性，然而也可涉及氢键、离子间相互作用、范德华作用。  The hydrophobic interaction between the protein and the active substance is mainly based on their hydrophobic character, however, it may involve hydrogen bonding, ionic interactions, van der Waals. 可将疏水性活性物质结合到表面、掺入微粒或另外同时以两种方法与微粒相连。 Hydrophobic active substance may be bound to the surface, or otherwise incorporated into particles simultaneously in two ways connected microparticles. 疏水性活性物质与微粒的结合可由在溶解的活性物质的组装混合物中的消耗来确定。 Binding the active material and the hydrophobic microparticles may be consumed in the assembly of a mixture of dissolved active substance is determined. 活性物质的浓度可由其特征的定量分析来确定。 The concentration of active substance may be determined by quantitative analysis feature. 因此，例如通过光度测定方法可分析光吸收活性物质的结合。 Thus, for example, the method may be analyzed by photometric light absorption of the active substance in combination. 为此，如在制剂混合物中微粒的着色或缺乏蛋白质和活性物质的相的去色通过测定有色活性物质的吸收值来确定。 For this reason, in the formulation as fine particles or mixture of colored lack of protein and active substance phase to color determined by measuring the absorbance of colored active substances. 使用这些方法， 也可确定微粒中活性物质含量高的程度。 Using these methods, the microparticles may also determine the extent of high active substance content. 作为由于蛋白酶对微粒的降解或通过合适溶剂对微粒的溶解结果而在合适溶剂中由于解吸附作用发生从微粒中释放活性物质。  Due to protease degradation as microparticles or by dissolving a suitable solvent and the result of the release of the active particles from the microparticles due to the desorption takes place in a suitable solvent. 针对解吸附作用的合适溶剂是所有可溶解活性物质的溶剂或溶剂混合物。 Suitable solvents for the desorption of the solvent or solvent mixture all soluble active substances. 合适的蛋白酶可作为工业级蛋白酶以靶向方式加入到蛋白质微粒的悬浮液中，或自然发生于效应分子期望的活性位点，例如皮肤蛋白酶、消化道蛋白酶，如胃或肠蛋白酶，或微生物释放的蛋白酶。 Suitable proteases may be added to the protein in a targeted manner as a technical grade fine particle suspension of a protease, or a desired effector molecule naturally occurring in the active site, proteases such as skin, digestive tract proteases such as stomach or gut proteases, or a microbial release proteases. 可溶解微粒的溶剂如氟化醇，例如六氟异丙醇或三氟乙醇，离子流体，如EMIM乙酸酯，离液序列高的盐的水溶液，如尿素、盐酸胍和硫氰酸胍，或有机酸，如蚁酸，以及这些溶剂与其它有机溶剂的混合物。 Solvent soluble particles such as fluorinated alcohols, for example, hexafluoroisopropanol or trifluoroethanol, ionic fluid, such as EMIM acetate, from an aqueous solution of chaotropic salts, such as urea, guanidine hydrochloride and guanidine thiocyanate, or organic acids, such as formic acid, and mixtures of these solvents with other organic solvents. 例如通过活性物质的电荷密度和微粒的大小和/或其体积与表面积的比率可调节效应分子的释放比率和动力学。 For example the ratio of effector molecule modified release kinetics and by the size and charge density of the particulate active substance and / or the ratio of volume to surface area. 低水溶性活性物质的配制也可通过其胶体分散溶液的稳定性来实现，例如通过微粉化。  The preparation of low water-soluble active substance may also be achieved by the colloidal stability of the dispersion solution, for example by micronization. 本发明还提供使用所述两亲性自组装蛋白质生产的蛋白质微粒或例如由微粉化生产的胶体分散蛋白质制剂，在药物、化妆品、农作物保护产品、食品和动物饲料的贮存、运输或释放活性物质中的用途。  The present invention further provides the use of self-assembled amphiphilic protein or a protein produced by, for example, dispersing fine particles of micronized protein preparation produced colloid, stored in the pharmaceutical, cosmetic, crop protection products, food and animal feed, transportation, or the use of the active substance release. 在这一情况中，蛋白质微粒另外提供用来如保护包装的活性物质免受环境影响，例如，氧化过程或UV射线，或免受由于与产品的其它成分反应而造成的破坏，或免受某些蛋白酶的降解。 In this case, the protein micelles as active substance provided for additional protective packaging from environmental influences, e.g., oxidation, or UV radiation, or against damage due to the reaction with the other ingredients of the product caused by, or from a these protease degradation. 活性物质可从蛋白质微粒或胶体分散蛋白质制剂中通过解吸附作用、蛋白水解性降解、靶向释放或缓慢释放或这些机制的组合来释放。 Active substance may be dispersed or colloidal protein particles from a protein preparation by desorption, proteolytic degradation, slow-release or targeted release, or a combination of these mechanisms to release. 优选在用于经口施用的药物中随其配制的蛋白质微粒和活性物质。  Preferably the active substance with the protein and particulate medicament is formulated for oral administration. 在这一情况中，经由胃的过程中可增加活性成分的稳定性，因为在本文通常的情况下没有蛋白质微粒的蛋白水解引起的降解发生。 In this case, the increased stability of the active ingredient through the stomach, because there is no proteolytic degradation of the protein caused by particles takes place under conditions described herein. 然后在肠内从经口施用的包含活性物质的微粒中释放活性物质。 Then release the active substance in the active substance-containing particulate enteral administration in the oral. 蛋白质微粒和其中包埋的药物活性物质的局部应用也是可能的。 And wherein the topical application of protein microparticles embedded pharmaceutically active substance is also possible. 蛋白质微粒的降解和从中引起的活性物质的释放然后由存在于皮肤和/或表皮层上的蛋白酶来调节。 Degradation and release of active substance from the protein caused by the fine particles is then adjusted in the skin and / or proteases in the skin layer. 在药品、食品和动物饲料以及农作物保护产品中，含有所述的两亲性自组装蛋白质的活性物质的制剂还可导致活性物质生物利用率的增加。  In the pharmaceutical, food and crop protection and animal feed products, comprising the amphiphilic substance assembled from the formulation of the active protein may result in increased bioavailability of active substance. 在活性物质的蛋白质微粒或胶体分散制剂中使用所述两亲性自组装蛋白质来包装药物的活性物质也可导致活性物质更能克服血脑屏障或促进经由肠黏膜的吸收。 Protein microparticles or colloidal dispersion of the active substance used in the formulation of the self-assembly of amphiphilic proteins to package the pharmaceutical active substance may also lead to overcome the blood brain barrier or more active substances to promote absorption via the intestinal mucosa. 通过胶囊化和/或包埋在蛋白质微粒中可保护农作物保护产品免受冲洗。  By encapsulated and / or embedded in crop protection products may protect the protein from microparticles flushing. 可由蛋白质微粒中的包装或经由胶体分散制剂，例如，通过使用两亲性自组装蛋白质的微粉化混合物来确定更好吸收和/或具有更好生物利用率的某种活性物质微粒大小。 Protein microparticles may be packaged formulation or via a colloidal dispersion, for example, by using self-assembled amphiphilic micronized mixture of proteins is determined to be better absorbed and / or an active material having a certain particle size and better bioavailability. 通过改变所述两亲性自组装蛋白质的氨基酸序列和/或通过与附加的蛋白质或多肽序列的融合，可能产生特异性识别某些表面如皮肤、毛发、叶片、根部或肠表面或血管表面和/或由这些表面或存在的受体来识别和结合的结构。  By changing the amino acid sequence of the amphiphilic self-assembly of proteins and / or by fusion with additional protein or polypeptide sequence may be generated that specifically recognize certain surfaces such as the skin, hair, leaves, roots, or the surface of the intestine or surface of blood vessels and / or recognize and bind to these surfaces or by the presence of receptor structure. 结果，可能使配制含有所述两亲性自组装蛋白质的活性物质对于期望的活性位点和/或改善活性物质的吸收更加有效。  As a result, of formulation may contain the amphiphilic more efficient self-assembly substance for the desired activity of the protein active site and / or improving the absorption of active substance. 如果将其包装在以与在消化道中结合到细胞（如黏膜细胞）某些表面标记的蛋白质融合和/或连接的形式附加存在的蛋白质微粒中，可增加药物活性物质或食品和动物饲料中的活性物质的生物利用率。 If packaged in some form of binding to a cell surface markers (e.g. mucosal cells) fusion protein in the digestive tract and / or an additional connection protein microparticles is present, the pharmaceutically active substance may be increased or food and animal feed bioavailability of the active substance. 这些蛋白质如来自罗伊乳杆菌（Lactobacillus reuteri)的MapA蛋白质或胶原结合蛋白质CnBP(Miyoshi等人，2006, Biosci. Biotechnol. Biochem. 70:1622-1628)或来自其它微生物，主要是天然的肠胃细菌丛的功能性相当的蛋白质。 These proteins such as collagen or MapA protein from Lactobacillus (Lactobacillus reuteri) binding proteins CnBP (Miyoshi et al., 2006, Biosci Biotechnol Biochem 70:... 1622-1628) or from other microorganisms, mainly bacteria naturally parenteral Cong functional equivalent protein. 所述的结合蛋白介导微生物吸附到细胞表面。 The binding mediated microorganisms adsorbed to the cell surface. 由于结合蛋白与所述两亲性自组装蛋白质接合和/或融合，从中形成的包含活性物质的蛋白质微粒将以更具靶向性的方式到达相应的吸附位点和/或在这些位点停留更长的时间，从而延长和改进活性物质的释放和吸收。 Since the protein bound to the protein self-assembled amphiphilic engage and / or fusion, protein comprising a particulate active material formed therefrom will be more targeted way to reach the corresponding adsorption sites and / or remain at these sites longer, thereby extending and improving the release of the active substance and absorption. 通过将80mgf3 -胡萝卜素和16mg生育酚溶解于IOg THF中来制备原液。  By 80mgf3 - carotene stock solution was prepared, and 16mg of tocopherol was dissolved in the IOg THF. 然后通过对应于表1. 1的稀释从该保存液中制备溶液1-4。 The preservation solution is then prepared from a diluted solution 1-4 in Table 1.1 by a corresponding. 所有溶液使用前现配并在稀释后立即使用。  Extemporaneous all solutions prior to use and used immediately after dilution. 为将胡萝卜素包装进C16蛋白质微粒，首先制备C16蛋白质和β-胡萝卜素的共同相。  The carotenes packaged into protein microparticles C16, C16 first common phase proteins and the preparation of β- carotene. 为此，每次将500 μ 1溶于5mM、pH 8磷酸钾中的10mg/ml C16蛋白质的溶液与50 μ 1或100 μ 1的β -胡萝卜素溶液混合（溶液1-4)(表1. 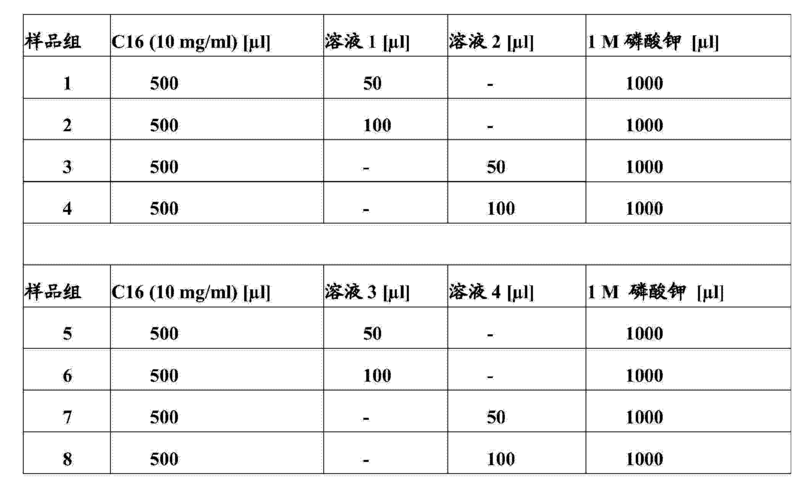 2)。 For this purpose, each time 5 mM β 500 μ 1 was dissolved, a solution of 10mg / ml C16 protein in the pH 8 potassium phosphate or with 50 μ 1 of 100 μ 1 - carotene mixed solution (solution 1-4) (Table 1 . 2). 在来自THF/异丙醇的含胡萝卜素的样品组情况下（样品组1-4)，获得橙色分散液；在来自THF的含β-胡萝卜素的样品组情况下（样品组5-8)，获得黄色分散液。 In the case of a sample group carotene from THF / isopropanol (Sample Groups 1-4), an orange dispersion is obtained; containing THF from the sample set where the β- carotene (sample groups 5-8) to obtain a yellow dispersion. 为了通过相分离诱导C16蛋白质微粒形成，将1000 μ 1的1Μ、pH 8. O磷酸钾溶液加入每一样品组中（表1.2)。  In order to induce phase separation by C16 protein particle formation, of the 1Μ 1000 μ 1, pH 8. 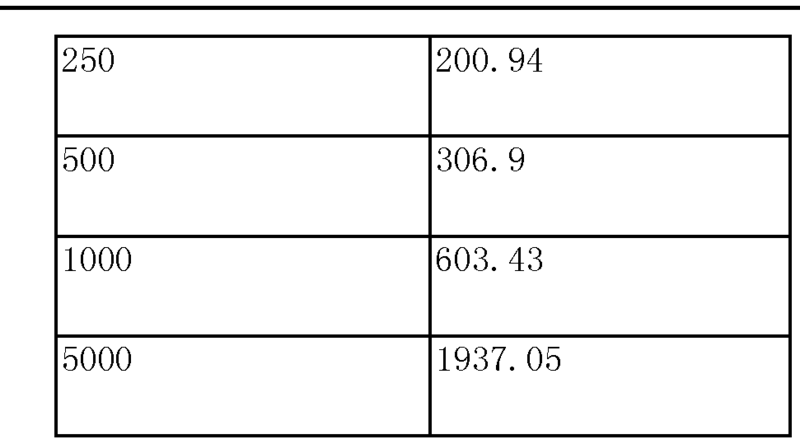 O potassium phosphate solution was added to each sample set (Table 1.2). 于室温孵育15分钟后，将样品组离心分离成包含β-胡萝卜素的C16蛋白质微粒的显著着色沉淀和无色上清液。 After incubation at room temperature for 15 min, the samples were centrifuged to separate into groups comprising C16 protein microparticles β- carotene is significantly colored precipitate and a colorless supernatant. 所用β-胡萝卜素因此在相位分离过程中完全转移到微粒中。 Β- carotene used in the phase separation process thus completely transferred to the microparticles. 分离掉无色上清液。 Colorless supernatant was separated off. 然后将沉淀用蒸馏水冲洗两次并重新分散。 The pellet was then rinsed twice with distilled water and re-dispersed. C16蛋白质微粒经再分散后，在来自THF/异丙醇包含β -胡萝卜素溶液的样品组情况下（样品组1-4)，获得橙色分散液；并且在来自THF包含β -胡萝卜素溶液的样品组情况下（样品组5-8)，获得黄色分散液。  After the C16 protein microparticles was re-dispersed in from THF / isopropanol containing β - carotene solution where the sample group (Sample Groups 1-4) to give an orange liquid dispersion; and from THF containing β - Carrot where the pigment solution sample set (samples 5-8 group), to obtain a yellow dispersion. 备选地向胡萝卜素和C16蛋白质的共同相中直接添加磷酸钾，相分离也可通过对IM磷酸钾透析来进行。  Alternatively, potassium phosphate to a common phase and C16 carotenoids proteins directly, by phase separation may also be carried out dialysis IM potassium phosphate. 由于透析在透析管中完成，与直接添加磷酸钾溶液相比，每次吸取10倍体积的样品组（表1. 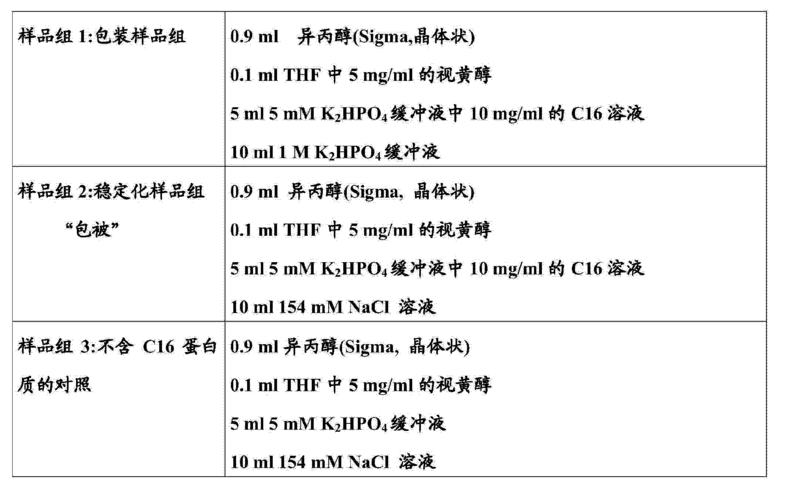 3)。 Since the completion of the dialysis in the dialysis tube, compared to the direct addition of potassium phosphate solution, 10 volumes of each sample to draw groups (Table 1.3). 为此，将C16溶液（10mg/ml于5mM、pH 8. 0磷酸钾中）与特定的β -胡萝卜素溶液混合然后将混合物立即放入透析管并且对IM磷酸钾溶液透析。  For this purpose, the C16 solution (10mg / ml in 5mM, pH 8. 0 potassium phosphate) with a particular β - carotene was mixed and then the mixture was immediately placed into a dialysis tube and dialyzed against IM potassium phosphate. 透析过夜后，将微粒分散液从管中移出并离心分离成无色上清液和着色沉淀。 After dialysis overnight, the fine particle dispersion liquid is removed and the supernatant centrifuged a colorless and a colored precipitate from the tube. 同样在向C16蛋白质和β-胡萝卜素的共同相中直接添加磷酸钾的情况下，C16蛋白质以蛋白质微粒的形式定量结合β-胡萝卜素。 Also in the case of potassium phosphate was added directly to a common phase proteins and β- carotene C16, C16 in the form of quantitative protein binding protein microparticles β- carotene. 分离并弃掉无色上清液。 Colorless supernatant was separated and discarded. 随后沉淀用蒸馏水冲洗两次然后重新分散。 The precipitate is then washed twice with distilled water and then redispersed. 蛋白质微粒经再分散后，在来自THF/异丙醇的包含β-胡萝卜素溶液的样品组情况下（样品组1-4)，获得橙色分散液；并且在来自THF的包含β -胡萝卜素溶液的样品组情况下（样品组5-8)，获得黄色分散液（图1)。  After the protein particles redispersed by, in the case of a sample group from a solution comprising a β- carotene THF / isopropanol (Sample Groups 1-4) to give an orange liquid dispersion; and from THF-containing β - sample set where the carotene solution (sample groups 5-8), to obtain a yellow dispersion (FIG. 1). 图1 :来自THF和THF/异丙醇的具有β -胡萝卜素的C16蛋白质微粒在水中的分散液。  Figure 1: with β from THF and THF / isopropanol - C16 carotenoid dispersion of protein microparticles in water. 从左至右：样品组D1-D4(THF/异丙醇）和样品组D5-D8(THF)。 From left to right: sample set D1-D4 (THF / isopropanol) and the sample D5-D8 (THF). 在C16蛋白质微粒中β -胡萝卜素的含量引用为基于C16蛋白质微粒重量的以重量计的百分数。 C16 β protein in the microparticles - carotene content referred to as percentages are by weight based on the weight of the C16 protein microparticles. 为了来自THF和THF/异丙醇的再生包含β-胡萝卜素的C16蛋白质微粒的不同着色，在更大范围内重复样品组D4和D5(表1.4)。  For regeneration from THF and THF / isopropanol C16 protein comprising differently colored particles β- carotene, duplicate samples Group D4 and D5 (Table 1.4) in a wider range. 再次从THF获得含β-胡萝卜素的黄色C16蛋白质微粒，并且从THF/异丙醇获得含β-胡萝卜素的橙色C16蛋白质微粒（图2)。 C16 again obtained yellow particles containing protein β- carotene from THF, and an orange C16 protein microparticles containing β- carotene (FIG. 2) from THF / isopropanol. 图2 :来自THF/异丙醇（以重量计0.9%的β-胡萝卜素，样品组G1，左）和THF(以重量计0.3%的β-胡萝卜素，样品组G2,右）的包含β-胡萝卜素的C16蛋白质微粒的分散液。  FIG. 2: from THF / isopropanol (0.9% by weight of β- carotene, sample groups G1, left) and THF (0.3% by weight of β- carotene, sample group G2, R) C16 protein comprising a dispersion of fine particles of β- carotene. 为说明C16蛋白质微粒中的β-胡萝卜素可通过蛋白质水解释放，将200 μ 1溶于水的微粒分散液Gl和G2与500 μ1的5Μ、ρΗ 8.0磷酸钾混合。  C16 protein microparticles β- carotene is released by proteolysis description, 200 μ 1 of water-soluble microparticle dispersion of Gl and G2 with 500 μ1 of 5Μ, ρΗ 8.0 potassium phosphate mixed. 然后加入5μ1蛋白酶K(罗氏（Roche), 19. 45mg/ml)并且将混合物于室温孵育过夜。 5μ1 then added proteinase K (Roche (Roche), 19. 45mg / ml) and the mixture was incubated at room temperature overnight. 每次使用的对照是无蛋白酶K的C16蛋白质微粒分散液的混合物。 Each time control is a mixture of C16 protein-free Proteinase K fine particle dispersion. 过夜孵育后，将混合物离心。 After overnight incubation, the mixture was centrifuged. 蛋白酶存在时，消化C16蛋白质微粒并且释放胡萝卜素。 When the presence of protease, digestion of protein microparticles and release the C16 carotenoid. 离心后，没有可见沉淀。 After centrifugation, no visible precipitate. 上清液高度着色。 The supernatant was highly colored. 无蛋白酶时， 可将完整的C16蛋白质微粒离心除去。 No protease may be a complete protein microparticles is removed by centrifugation C16. 可观察到显著着色的沉淀。 The precipitate was observed significant coloration. 上清液无色。 The supernatant was colorless. 图3通过蛋白酶K消化C16蛋白质微粒分散液。  FIG. 3 dispersion by a protease digestion of protein microparticles C16 K. Α)无蛋白酶的来自THF/异丙醇的包含胡萝卜素的C16蛋白质微粒（以重量计百分之0.9的β-胡萝卜素，样品组G1)， Β)有蛋白酶的来自THF/异丙醇的包含β -胡萝卜素的C16蛋白质微粒（以重量计0. 9% 的胡萝卜素，样品组G1)，C)无蛋白酶的来自THF的包含β-胡萝卜素的C16蛋白质微粒（以重量计0.3%的β-胡萝卜素，样品组G2) ;D)有蛋白酶的来自THF的包含β-胡萝卜素的C16蛋白质微粒（以重量计0.3%的β-胡萝卜素，样品组G2)。 [Alpha]) from the protease-free THF / isopropanol C16 protein microparticles containing carotene (0.9 percent by weight of β- carotene, sample group G1), Β) protease from THF / isopropanol containing β - carotene C16 protein microparticles (0.9% by weight of the carotenoid, the sample group G1), C) protease-C16 protein microparticles comprising a β- carotene from THF (0.3% by weight β- carotene, sample group G2); D) protease from C16 protein microparticles of THF (0.3% by weight β- carotene containing β- carotene, sample group G2). 通过使用在人体胃部和/或肠内起作用的不同蛋白酶来处理含胡萝卜素的C16蛋白质微粒，目的是说明作为用于药物有效物质的存储、运输和/或传递系统的蛋白质微粒的适宜性。  By using the human stomach and / or intestine to handle different proteases acting protein microparticles containing C16 carotenoid, as a storage for the purpose of illustrating a pharmaceutically effective substances, transport and / or delivery system of protein microparticles suitability. 为制备含有胡萝卜素的C16蛋白质微粒，将8Omg0-胡萝卜素和16mg维生素E溶解于IOml THF中并且然后用90ml异丙醇稀释。  C16 protein microparticles is prepared containing the carotenoid, carotene and the 8Omg0- 16mg vitamin E was dissolved in IOml THF and then diluted with 90ml of isopropanol. 然后将部分该溶液与10体积的C16蛋白质溶液混合（l〇mg/ml于5mM、pH 8磷酸钾缓冲液中）。 The protein solution was mixed with 10 parts of the solution volume of C16 (l〇mg / ml in 5mM, pH 8 potassium phosphate buffer). 然后将混合物与2体积的1Μ、ρΗ 8磷酸钾缓冲液混合。 The mixture was then with 2 volumes of 1Μ, ρΗ mixing 8 potassium phosphate buffer. 将产生的含β -胡萝卜素的C16蛋白质微粒通过离心获得，并且通过用水冲洗沉淀物来去除剩余的游离β-胡萝卜素。 The resulting containing β - carotene C16 protein microparticles obtained by centrifugation, is removed and the remaining free β- carotene precipitate by washing with water. 20mg含β -胡萝卜素的C16蛋白质微粒用2ml人造胃液（6. 4mg胃蛋白酶、80mM 此1、411^似(：1)或21111人造肠液1(2〇11^胰酶、0.451、？!17.5磷酸钠、0.91111牛磺胆酸钠）或2ml人造肠液II (20mg胰酶、0· 45M、pH 7. 5磷酸钠、6mM牛磺胆酸钠）进行重悬，并于37°C 振荡（HOrpm)孵育0、1、2、6、24和48h。未被蛋白水解而降解的C16蛋白质微粒经由600nm 处悬浮液的散射来测定（图4)。然后通过离心获得完整的C16蛋白质微粒，并且通过445nm 处吸收值的测定来分析上清液中β -胡萝卜素的含量（图5)。  20mg containing β - carotene C16 protein microparticles with 2ml artificial gastric juice (6. 4mg pepsin, 80mM ^ 1,411 like this (: 1) or artificial intestinal juice 21111 1 (2〇11 ^ trypsin, 0.451, ?! 17.5 sodium phosphate, sodium taurocholate 0.91111) or artificial intestinal juice 2ml II (20mg trypsin, 0 · 45M, pH 7. 5 phosphate, 6mM sodium taurocholate) resuspended, and at 37 ° C oscillation (HOrpm) 0,1,2,6,24 and 48h of incubation. unsubstituted C16 proteolytic degradation via protein microparticles suspension scattering at 600nm was measured (FIG. 4) is then a complete protein microparticles by centrifugation C16 , and the supernatant was analyzed by measuring the β absorbance at 445nm - carotene content (FIG. 5). 由于用含胃蛋白酶的人造胃液处理，甚至在48h后，才刚刚降解C16蛋白质微粒(图4)并因此释放β -胡萝卜素（图5)。  Since the artificial gastric juice containing pepsin, even after 48h, just degradation C16 protein microparticles (FIG. 4) and thus the release of β - carotene (FIG. 5). 反之，用含胰酶的人造肠液I和I处理，在仅仅6h内实际上完全降解C16蛋白质微粒（图4)并且释放存在的β-胡萝卜素（图5)。 Conversely, I and treated with simulated intestinal fluid containing trypsin I, in fact, complete degradation of C16 protein microparticles (FIG. 4) in just 6h and releases β- carotene present (FIG. 5). 因此， C16蛋白质微粒在经过人体胃部时耐受住而没有显著降解并且由于肠道中的蛋白水解降解而只释放结合的效应物质。 Thus, C16 protein particles passes human stomach withstand being without significant degradation and due to proteolytic degradation in the gut only Release of bound material. 图4 :通过分析600nm处的光吸收值来测定完整的C16蛋白质微粒。  Figure 4: is determined by analyzing the absorbance at 600nm C16 intact protein particles. 图5 :通过分析445nm处的光吸收值来测定从C16蛋白质微粒中释放的β -胡萝卜素。  FIG. 5: is determined by analyzing the absorbance at 445nm of protein released from the microparticles C16 β - carotene. 将2g的晶体状番茄红素和0. 4g的α -生育酚溶解于500g THF中。  2g of the crystalline lycopene and α 0. 4g of - tocopherol dissolved in 500g THF. 在室温条件下，活性物质溶液以2. 42g/分钟的流速与在5mM磷酸钾缓冲液（pH 8)中0. 2g/l的C16蛋白质组成的流速为25. 4g/分钟的水溶液不断混合。 Flow rate at room temperature, the active substance solution 2. 42g / min and a flow rate of buffer (pH 8) in 5mM potassium phosphate 0. 2g / l of a protein consisting of C16 25. 4g / min continuously mixing an aqueous solution. 在THF/水混合物中混合形成的活性物质微粒具有l〇3nm的微粒大小。 Active material particles in THF / water mixture formed by mixing the l〇3nm having particle size. 2h后，用C16蛋白质处理的样品（图6B)与未处理样品(图6A)相比可见明显的分散稳定性。 After 2h, the protein sample treated with C16 (Fig. 6B) with the untreated sample (Fig. 6A) as compared to the dispersion stability can be seen clearly. 甚至在几天后，含C16蛋白质的番茄红素分散液显示出稳定性，然而未处理的番茄红素分散液很大程度上絮凝（图7)。 Even after a few days, a dispersion containing lycopene C16 protein exhibits stability, but untreated lycopene flocculated dispersion of extent (FIG. 7). 将由于C16蛋白质稳定的某些番茄红素分散液浓缩成含量为0.28%的固体。 The C16 protein stabilization since certain lycopene dispersion was concentrated to a solid content of 0.28%. 这样，干燥的番茄红素很难分散。 Thus, lycopene dried difficult to disperse. 备选地，由C16蛋白质稳定的番茄红素分散液用330mM磷酸钾处理（混合物中的终浓度）并干燥。 Alternatively, the C16 lycopene stabilized protein dispersion treatment using 330mM potassium phosphate (final concentration in the mixture) and dried. 得到易于分散的番茄红素粉末。 Obtained readily dispersible lycopene powder. 图6 :用C16蛛丝蛋白配制番茄红素。  FIG. 6: C16 spider silk protein formulated with lycopene. 混合后（黑色图）和混合后2h(红色图）的未处理的番茄红素样品（A)和用C16蛋白质处理的番茄红素样品的光吸收值（B)。 After mixing (black) and after mixing 2h (FIG red) lycopene untreated sample (A) and the light absorption values ​​C16 lycopene treated protein sample (B). 图7 :用C16蛛丝蛋白配制番茄红素。  Figure 7: C16 spider silk protein formulated with lycopene. 混合后约30天时未处理的番茄红素分散液(左）与C16蛋白质稳定的番茄红素分散液（右）的比较。 After mixing for about 30 days Comparative untreated lycopene dispersion (left) and the C16 protein stabilization lycopene dispersion (right). 可将低水溶性的植物活性物质包装在制备自两亲性自组装蛋白质的蛋白质微粒中，然后从其中释放。  low water solubility may be packaged in a plant substances protein microparticles prepared from a self-assembled amphiphilic proteins, and then released therefrom. 为此，所选的非限定性实例是除草剂活性物质吡唑草胺。 For this reason, non-limiting examples of herbicidal active substance is selected pyrazol cafenstrole. 500 μ 1的含10mg/ml C16蛋白质的磷酸钾溶液（5mM、pH 8. 0)与100 μ 1吡唑草胺溶液（50mg/ml于异丙醇中）混合。 Containing  500 μ 1 of 10mg / ml C16 potassium phosphate solution protein (5mM, pH 8. 0) and 100 μ 1 cafenstrole pyrazol solution (50mg / ml in isopropanol) were mixed. 通过加入1ml的IM磷酸钾缓冲液（pH 8. 0)来诱导C16蛋白质微粒的形成。 C16 protein to induce formation of fine particles by the addition of 1ml of IM potassium phosphate buffer (pH 8. 0). 混合物于室温孵育lh，然后在20000Xg下离心10分钟。 The mixture was incubated lh at room temperature and then centrifuged at 20000Xg for 10 min. 沉淀用5ml双蒸水冲洗两次然后冻干。 The precipitate was then washed twice with 5ml of double distilled water lyophilized. 不含C16蛋白质的同样的混合物作为对照。 C16 protein-free mixture of the same as a control. 用磷酸钾沉淀后，于C16蛋白质和吡唑草胺的混合物中形成微粒。  After precipitation with potassium phosphate, and a mixture of proteins pyrazol-C16 alachlor forming microparticles. 这些与那些含C16蛋白质但不含活性物质的标准混合物是在形态学上相当的。 These those containing C16 protein but the standard does not contain a mixture of active substances is comparable in morphology. 在C16吡唑草胺混合物中， 没有可见的吡唑草胺晶体。 Pyrazole amine mixture of C16 grass, no visible crystal pyrazol cafenstrole. 另一方面，在不含C16蛋白质的吡唑草胺混合物中形成了大量活性物质晶体。 On the other hand, a large amount of active substance crystals formed in-pyrazol-free mixture of alachlor C16 protein. 这说明C16蛋白质在水性磷酸钾缓冲液存在下对吡唑草胺的结晶化具有明显的抑制效应。 This indicates that C16 protein has significant inhibitory effect on the crystallization pyrazol alachlor in the presence of aqueous potassium phosphate buffer. C16蛋白质沉淀或C16微粒形成后上清液中吡唑草胺浓度的测定显示，大约90% 的活性物质在蛋白质微粒中以包装形式和/或以与其连接的形式存在。 After  C16 C16 protein precipitation or particulate formation assay pyrazol alachlor concentrations in the supernatant showed that about 90% of the active substance is present in the form of packaging and / or connected therewith in a protein microparticles. 每次约20%的活性物质存在于冲洗上清液中。 Each about 20% of the active substance is present in the supernatant rinse. 冻干的含吡唑草胺的C16蛋白质微粒于37°C在Iml IOmM Tris缓冲液、0. 1%SDS、 100 μ g蛋白酶K中进行蛋白水解消化lh。  The lyophilized protein containing pyrazol-C16 alachlor particles at 37 ° C in buffer Iml IOmM Tris, 0. 1% SDS, 100 μ g proteolytic digestion of proteinase K lh. 离心10分钟（20000Xg)后的混合物中剩余的活性物质晶体在500 μ 1异丙醇中溶解。 The mixture was centrifuged for 10 minutes (20000Xg) remaining in the active substance crystals were dissolved in 500 μ 1 of isopropanol. 在蛋白酶消化的上清液中检测到约使用量的11% 的吡唑草胺。 Detecting the amount of about 11% of the alachlor-pyrazol protease digestion supernatant. 活性物质晶体再溶解到含有约使用量的35%的吡唑草胺的异丙醇中。 Active substance crystals redissolved to 35% isopropanol-pyrazol-containing alachlor used in an amount of from about. 可将对于如氧自由基、UV等的影响不稳定的低水溶性的或水不溶的活性物质包装在制备自两亲性自组装蛋白质的蛋白质微粒中。  As may be unstable to the effect of oxygen free radicals, UV or other low water-solubility of water-insoluble active substance in the package prepared from the protein self-assembled amphiphilic protein microparticles. 它们也可继而从其中再次释放。 From which they may then be released again. 此外，活性物质配制和/或包装在蛋白质微粒中可保护其免受有害影响和由此引起的降解。 Furthermore, the active substance is formulated and / or packaged in protein microparticles may be protected from degradation and harmful effects caused thereby. 为说明这些，所选的非限定性实例是活性物质视黄醇，将其包装在C16蛋白质微粒中，并在空气、 均匀搅动数小时搅动起泡。 To illustrate these, non-limiting examples of the active substance is selected retinol, which is packaged in a protein microparticles C16 and air, a uniform foaming agitation agitation hours. 在不同时间点上，取出样品并且在THF萃取后量化剩余的视黄醇。 At different time points, samples were removed and the remaining quantized retinol after THF extraction. 研宄表5. 1中所示的样品组。  study based on a sample set shown in Table 5.1. 为此，首先将异丙醇中视黄醇-THF溶液稀释，然后与水性C16蛋白质溶液混合，然后在样品组1的情况下，通过加入IM磷酸钾溶液来诱导C16 蛋白质微粒形成。 For this, first diluted isopropanol retinol -THF solution, and then mixed with the aqueous protein solution C16, and in the case of sample group 1, C16 protein induced by the addition of fine particles formed IM potassium phosphate solution. 由于阳离子的存在，如经由C16蛋白质包装样品组中的磷酸钾，原则上有助于增加游离溶解的视黄醇或以微粒形式出现的视黄醇的氧化，将154mM氯化钠溶液加入到含和不含C16蛛丝蛋白的对照中，但其中没有诱导C16蛋白质微粒形成（参见Fisher 等，1972, Biochem. J. 132:259-270)。 Due to the presence of cations, such as potassium phosphate C16 via protein sample packing group, helps to increase the principle of free dissolved retinol or retinol oxidation occurring in particulate form, is added to the solution containing 154mM sodium chloride and a control containing no C16 spider silk protein, but which does not induce formation of protein micelles C16 (see Fisher et al, 1972, Biochem J. 132:. 259-270). 样品组孵育在用塑料盖子封闭的玻璃容器中进行，在磁力搅拌器上搅拌并且经由套管连续起泡达7h。 Samples were incubated in the group with a plastic lid closed glass container and stirred on a magnetic stirrer and a continuous bubbling up through the cannula 7h. 取样时每次取出4X300 μ 1，通过计算，在其各自中应存在9. 38 μ g最大量的视黄醇。 Sampling takes out 4X300 μ 1, by calculation, 9. 38 μ g should be present in a maximum amount of retinol in their respective. 移除后，将包装样品组的C16微粒离心分离，并且得到的视黄醇用1.5ml THF萃取并通过325nm处的吸光度测定来定量。 After removal of the centrifuged sample C16 packaging group separated particles, and the resultant was extracted with retinol 1.5ml THF and quantified by measuring the absorbance at 325nm. 在没有C16微粒的样品组情况下，将I. 5ml THF直接加入到300 μ 1样品中，混合样品并且离心以实现相分离。 In the group of samples without C16 particles will I. 5ml THF was added directly to 300 μ 1 sample, the sample is mixed and centrifuged to achieve a phase separation. 然后出现在THF相上层的视黄醇同样借助于325nm处的吸光度测定来定量。 Then the upper phase appears in THF retinol was quantified by means of absorbance was also measured at 325nm. 表5. 1 :用于量化C16蛛丝蛋白介导的视黄醇氧化稳定性的多种样品组。  Table 5.1: sample set used to quantify more oxidative stability of retinol mediated C16 spider silk protein. 在含有C16蛛丝蛋白的样品组中（样品组1-包装在C16微粒中，样品组2-可溶性C16)，与不含C16蛋白质的对照相比，观察到在大气中氧气存在下视黄醇的显著稳定性(表5. 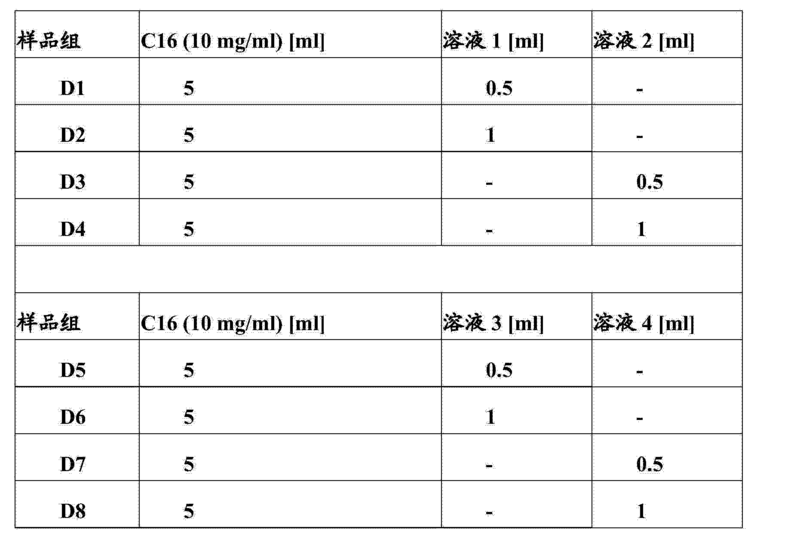 2 ;图8)。  In the sample group comprising C16 spider silk protein (C16 packaged in a sample group microparticles 1-, 2- sample group soluble C16), C16 compared to the control containing no protein was observed in the presence of oxygen in the atmosphere significant stability of retinol (table 5.2; Fig 8). 然而样品组2中视黄醇的量也在5至7h后显著降低，已将活性成分包装进C16微粒的样品组1中，甚至在7h后也可检测到超过70%的完整视黄醇（表5.2 ;图8)。 However, the amount of retinol Sample Group 2 are significantly decreased after 5 to 7h, have active ingredient packaged into C16 microparticles sample set 1, even after 7h can be detected more than 70% intact retinol (Table 5.2; FIG. 8). 因此，C16微粒中视黄醇的包装看来是合适的方法，通过该方法可起到抵抗氧自由基诱导的降解的稳定作用。 Thus, the packaging C16 retinol microparticles appears to be a suitable method, by which a stabilizing effect may be resistant to degradation induced by oxygen radicals. 在Iml 5mM、pH 8磷酸钾缓冲液中，利用蛋白酶K(2.25U)通过蛋白水解来降解装载视黄醇的C16微粒，可以释放出活性成分。 To degrade retinol loaded microparticles by proteolytic C16 Iml 5mM, pH 8 potassium phosphate buffer, using proteinase K (2.25U), the active ingredient can be released. 表5. 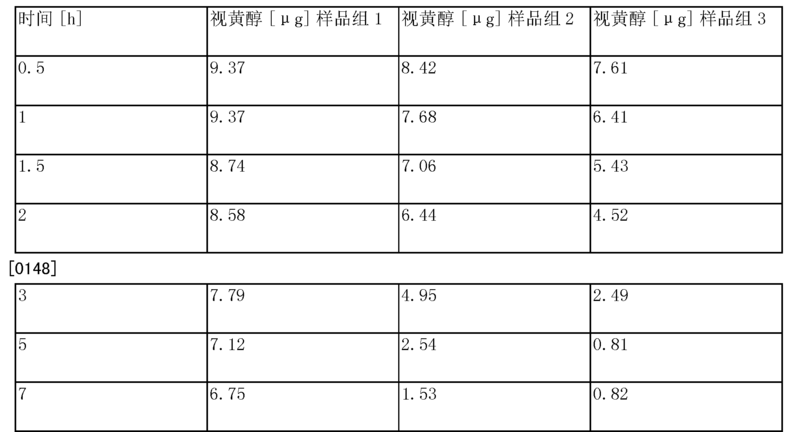 2 :C16制剂样品组中视黄醇稳定性的测定。  Table 5.2: Stability Determination of retinol formulation C16 view sample set. 图8 :C16制剂样品组中作为孵育时间的函数的视黄醇稳定性的测定。  FIG. 8: Determination of stability of retinol C16 formulation sample set as a function of incubation time. 为确定C16微粒对活性物质的最大装填密度，在包装样品组中使用不同量的视黄醇（参见样品组1)。  To determine the maximum packing density of the C16 particles of the active material, different amounts of retinol in a packaging sample set (see Sample Group 1). 此处针对活性物质使用的溶剂是专用的THF。 The solvent used here for the active substance is dedicated THF. 然后通过加入IM磷酸钾缓冲液（pH 8. 0)来诱导C16蛋白质微粒形成。 C16 protein was then induced by the addition of fine particles formed IM potassium phosphate buffer (pH 8. 0). 样品组在10°C孵育lh，然后在20000Xg 下离心10分钟。 Sample Set 10 ° C and incubated lh, and then centrifuged at 20000Xg for 10 min. 形成的沉淀用蒸馏水冲洗两次。 The precipitate formed was washed twice with distilled water. 然后通过用2ml THF冲洗C16蛋白质微粒来溶解掉活性物质并且借助于325nm处吸光度测定来进行定量（参见表5. 3)。 C16 is then dissolved by washing with 2ml THF protein microparticles away by means of the active material and the absorbance was measured at 325nm to quantify (see Table 5.3). 结果显示，本试验中视黄醇的最大负荷密度大约是I. 9mg每5mg所用C16蛋白质（表5. 3)。 The results show that the density of this test, the maximum load retinoid I. 9mg about 5mg per the C16 protein (Table 5.3). 在对C16微粒定量沉淀的情况下，视黄醇活性物质浓度或装填密度相应为约38%。 In the case where quantitative C16 particles precipitated, the concentration of active material retinol or a corresponding packing density of about 38%. 表5. 3 :量化包装在5mg C16微粒中并且从中再次释放的视黄醇。  Table 5.3: quantization packaging 5mg C16 microparticles released again therefrom and retinol. 可将低水溶性的或水不溶的药物活性物质包装在制备自两亲性自组装蛋白质的蛋白质微粒中。  may be water-insoluble or low water-solubility of the pharmaceutically active substance is packaged in a protein microparticles prepared from a self-assembled amphiphilic proteins. 然后它们也可从其中再次释放。 Then they can also be released again from them. 另外，通过蛋白质微粒中活性物质的配制和/或包装可保护其免受有害影响，例如，某些蛋白酶或强酸性PH值以及从中引起的降解。 Further, the active substance is formulated and / or packaging may be protected from harmful effects, e.g., certain proteases, or a strongly acidic PH value and the degradation caused by protein from the microparticles. 更好吸收和/或具有更好生物利用率的某种活性物质微粒大小或活性物质结构可由蛋白质微粒中活性物质的包装和/或经由使用两亲性自组装蛋白质的微粉化样品组来确定。 Better absorption and / or active substance having a certain particle size or structure of the active substance may be a better bioavailability of the active protein microparticles packaging material and / or determined through the use of self-assembling amphiphilic proteins micronised sample set. 为说明这些，选择活性物质布洛芬[(RS)-2-(4-异丁苯基）丙酸]作为非限定性实例。 To illustrate these, selected active substance ibuprofen [(RS) -2- (4- isobutyl-phenyl) propionate] As non-limiting examples. 500 μ 1含10mg/ml C16蛋白质的磷酸钾溶液（5mM、pH 8. 0)与100 μ 1布洛芬溶液（5mg/ml于异丙醇中）混合。  500 μ 1 containing 10mg / ml C16 potassium phosphate solution protein (5mM, pH 8. 0) and 100 μ 1 of ibuprofen solution (5mg / ml in isopropanol) were mixed. 通过加入1ml IM磷酸钾缓冲液（pH 8. 0)来诱导C16蛋白质微粒形成。 C16 protein induced by the addition of fine particles formed 1ml IM potassium phosphate buffer (pH 8. 0). 样品组于室温孵育Ih并然后以20000Xg离心10分钟。 Samples were incubated for Ih at RT and the group was then centrifuged at 20000Xg for 10 min. 沉淀用5ml双蒸水冲洗两次。 Precipitate was washed twice with 5ml of double distilled water. 用磷酸钾沉淀后，微粒形成于C16蛋白质和布洛芬的样品组中。  After precipitation with potassium phosphate, particle formation in the sample group in the C16 protein and ibuprofen. 这些与那些含C16 蛋白质但不含活性物质的标准样品组在形态学术语上是相当的。 These proteins but those standard samples containing C16 group containing no active material is morphologically comparable terms. 在该样品组中将布洛芬包装进C16蛋白质微粒是定量完成的，并且这是诱导微粒形成后在上清液中借助于吸光度测定可检测到布洛芬的原因。 The sample set in the ibuprofen particles are packaged into protein quantification C16 accomplished, and this is the reason for the absorbance measurement may be detected by means of Ibuprofen induced particle formation in the supernatant. 由于在Iml的5mM、pH 8磷酸钾缓冲液中利用蛋白酶K(2. 25U) 非特异性蛋白水解来降解装载布洛芬的C16微粒，释放出活性成分。 Because of 5mM Iml, pH 8 potassium phosphate buffer, using proteinase K (2. 25U) to non-specific proteolytic degradation load ibuprofen C16 microparticles release the active ingredient. 在含胃蛋白酶的样品组中（类似于实施例2)，装载布洛芬的C16蛋白质微粒的蛋白水解消化未能导致活性物质的释放。  In the sample group containing pepsin (similar to Example 2), the loading of ibuprofen C16 proteolytic digestion of protein microparticles failed to cause release of the active substance. 在含胰酶的样品组中（类似于实施例2)，布洛芬装载的C16蛋白质微粒的处理导致活性物质的释放。 In sample set containing pancreatin (similar to Example 2), the processing load of the C16 protein microparticles ibuprofen causes release of the active substance. 因此，C16微粒可提供保护以抵抗胃部蛋白酶和胃中常见的极其酸性PH值。 Thus, C16 microparticles may provide protection against the stomach proteases and acidic stomach PH value is extremely common. 然而，肠内条件下的释放是可能的。 However, under the conditions in the intestine release it is possible. C16微粒因此适合， 尤其是经口施用的、在肠内吸收的或有效的并且在经过胃部时将被保护的活性物质的包装和配制。 C16 particles therefore suitable, in particular, oral administration, or formulated in packaging and effective intestinal absorption of active substances through the stomach and when to be protected. 1. 两亲性自组装蛋白质在配制低水溶性有效物质中的用途。 1. The use of self-assembled amphiphilic proteins in formulating low soluble active substance. 2. 权利要求1的用途，其中两亲性自组装蛋白质是形成微粒的蛋白质。 2. The use as claimed in claim 1, wherein the self-assembled amphiphilic protein is a protein particle formation. 3. 权利要求1的用途，其中两亲性自组装蛋白质是固有无折叠蛋白质。 The use of claim 1, wherein the amphiphilic proteins are inherently non-self-assembled protein folding. 4. 权利要求1的用途，其中两亲性自组装蛋白质是丝蛋白。 The use of claim 1, wherein the self-assembled amphiphilic protein is a silk protein. 5. 权利要求1的用途，其中两亲性自组装蛋白质是蛛丝蛋白。 The use of claim 1, wherein the amphiphilic protein is a self-assembling spider silk proteins. 6. 权利要求1的用途，其中两亲性自组装蛋白质是C16蛛丝蛋白。 The use of claim 1, wherein the amphiphilic protein is a self-assembling spider silk protein C16. 7. 权利要求1至6的用途，其中所用有效物质是药物活性成份。 The use of claim 1 to 6, wherein the active substance is a pharmaceutically active ingredients used. 8. 权利要求1至6的用途，其中所用有效物质是农作物保护活性成分。 1 to 6. The use of claim 1, wherein the active substance is used for crop protection active ingredient. 9. 权利要求1至6的用途，其中所用有效物质是用于皮肤和头发的化妆品的活性成分。 9. The use as claimed in claim 1 to 6, wherein the active substance is an active ingredient used for skin and hair cosmetics. 10. 生产有效物质制剂的方法，其中(i) 低水溶性有效物质与两亲性自组装蛋白质在共同的分散相中混合在一起，和(ii) 然后进行相分离形成富含蛋白质和有效物质的相，和缺乏蛋白质和有效物质的相。 10. The method of producing the active substance formulation, wherein (i) a low water-soluble active substance and the amphiphilic protein self-assembled in a common mixing together the dispersed phase, and (ii) followed by phase separation of proteins and rich in active substance phase, and lack of phase proteins and effective substances. 11. 权利要求10的方法，其中相分离（ii)通过离液盐实现。 11. The method of claim 10, wherein the phase separation (ii) implemented by a chaotropic salt. 12. 权利要求10的方法，其中工作温度在5和50°C之间。 12. The method of claim 10, wherein the operating temperature is between 5 and 50 ° C.
13. 权利要求10至12的方法，其中将富含蛋白质和有效物质的相硬化和作为机械稳定的含有效物质的蛋白质微粒分离，且如果合适进行干燥。 13. A method as claimed in claim 10 to 12, wherein the protein-rich phase and hardened, and the active substance as a mechanically stable protein microparticles containing the active substances separated, and dried if appropriate. 14. 化妆品制剂，其包含已用至少一种两亲性自组装蛋白质配制的低水溶性有效物质， 连同另外的化妆品辅剂。 14. A cosmetic preparation, comprising at least one has a self-assembled amphiphilic protein-low soluble active substance formulated, together with further cosmetic adjuvants. 15. 药物制剂，其包含已用至少一种两亲性自组装蛋白质配制的低水溶性有效物质，连同另外的药物辅剂。 15. A pharmaceutical formulation comprising at least one has a self-assembled amphiphilic protein-low soluble active substance formulated, together with further pharmaceutical adjuvants. 16. 农用化学品制剂，其包含已用至少一种两亲性自组装蛋白质配制的低水溶性有效物质，连同另外的农用化学品辅剂。 16. The agrochemical formulation, which contains at least one amphiphilic with self-assembled low soluble active substance formulated protein, together with further agrochemical adjuvants.